Supercomputer simulations help Hubble see farther into the universe and reveal a startling fact: It's not as crowded as once thought. Don't worry though, you're still not alone. Simulations conducted on the Blue Waters supercomputer at the National Center for Supercomputing Applications (NCSA) suggest there may be far fewer galaxies in the universe than expected. 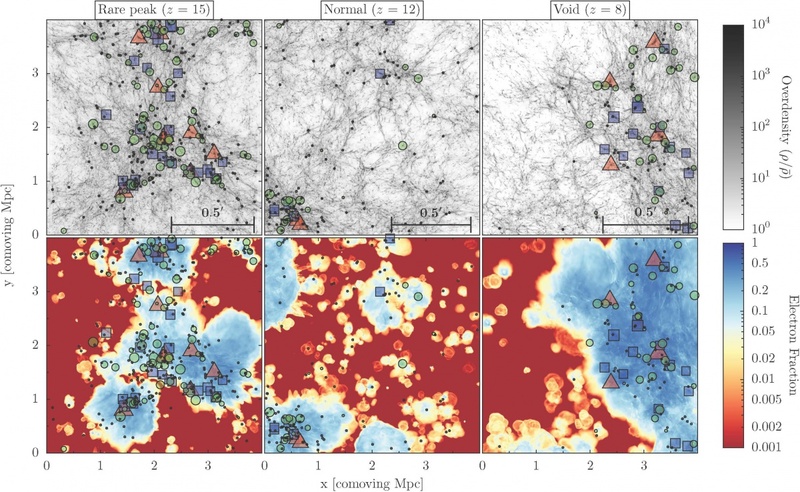 The study, published this week in Astrophysical Journal Letters, shows the first results from the Renaissance Simulations, a suite of extremely high-resolution adaptive mesh refinement calculations of high redshift galaxy formation. Taking advantage of data transferred to SDSC Cloud at the San Diego Supercomputer Center (SDSC), these simulations show hundreds of well-resolved galaxies. Launched in 2011 at the University of California, San Diego, SDSC Cloud is one of the first ever large-scale academic deployments of cloud storage in the world. SDSC Cloud's high-speed connectivity, coupled with its cloud architecture, provides a flexible resource for hosting large-scale archives such as the Renaissance Simulations. “Most critically, we show that the ultraviolet luminosity function of our simulated galaxies is consistent with observations of redshift galaxy populations at the bright end of the luminosity function, but at lower luminosities is essentially flat rather than rising steeply,” says principal investigator and lead author Brian W. O'Shea, an associate professor at Michigan State University. This discovery allows researchers to make several novel and verifiable predictions ahead of the October 2018 launch of the James Webb Space Telescope, a new space observatory succeeding the Hubble Space Telescope. The simulations ran on the National Science Foundation (NSF) funded Blue Waters supercomputer, one of the largest and most powerful academic supercomputers in the world. “These simulations are physically complex and very large — we simulate thousands of galaxies at a time, including their interactions through gravity and radiation, and that poses a tremendous computational challenge,” says O'Shea. Blue Waters, based at the University of Illinois, is used to tackle a wide range of challenging problems, from predicting the behavior of complex biological systems to simulating the evolution of the cosmos. The supercomputer has more than 1.5 petabytes of memory — enough to store 300 million images from a digital camera — and can achieve a peak performance level of more than 13 quadrillion calculations per second. “The flattening at lower luminosities is a key finding and significant to researchers' understanding of the reionization of the universe, when the gas in the universe changed from being mostly neutral to mostly ionized,” says John H. Wise, Dunn Family assistant professor of physics at the Georgia Institute of Technology. 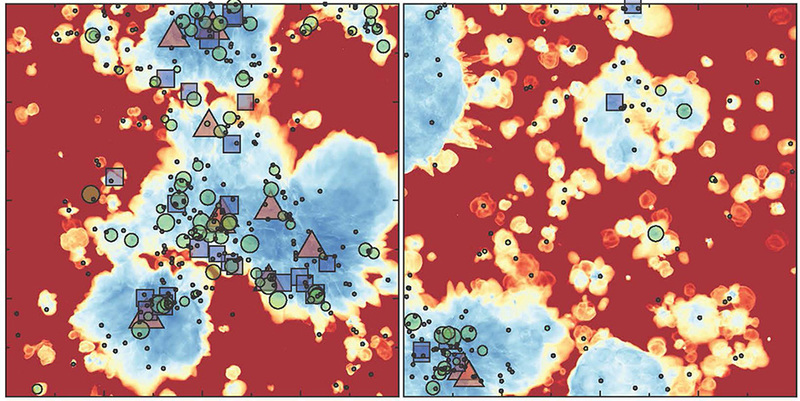 Matter overdensity (top row) and ionized fraction (bottom row) for the regions simulated in the Renaissance Simulations. The red triangles represent locations of galaxies detectable with the Hubble Space Telescope. The James Webb Space Telescope will detect many more distant galaxies, shown by the blue squares and green circles. These first galaxies reionized the universe shown in the image with blue bubbles around the galaxies. Courtesy Brian W. O'Shea (Michigan State University), John H. Wise (Georgia Tech); Michael Norman and Hao Xu (UC San Diego). Click for larger image. The term 'reionized' is used because the universe was ionized immediately after the fiery big bang. During that time, ordinary matter consisted mostly of hydrogen atoms with positively charged protons stripped of their negatively charged electrons. Eventually, the universe cooled enough for electrons and protons to combine and form neutral hydrogen. They didn't give off any optical or UV light — and without it, conventional telescopes are of no use in finding traces of how the cosmos evolved during these Dark Ages. The light returned when reionization began. In an earlier paper, previous simulations concluded that the universe was 20 percent ionized about 300 million years after the Big Bang; 50 percent ionized at 550 million years after; and fully ionized at 860 million years after its creation.